A modern style (1908-1935) that swept across the globe, adding a glamorous edge to everything from fashion to interiors. The distinctive iconography of Art Deco includes natural symbols such as sunbursts and plants, together with manmade skyscrapers and machines. Art Deco celebrates fantasy, fun and glamour and still has huge appeal today. An architectural grey for restful spaces. Gentle, graceful and flushed with atmospheric brightness. Use with 1829 White Undercoat. 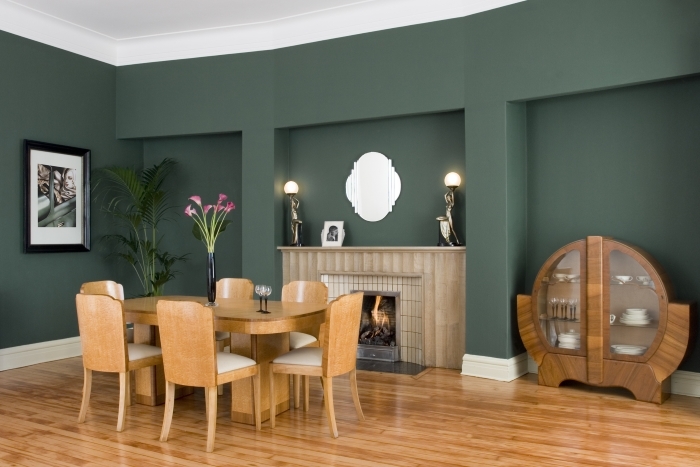 Popular in the Art Deco era, this evocative peacock blue-green is ideal for an elegant living area. Use with 1829 Light Grey Undercoat. A modern mineral hue, this inky blue-black evokes the vivid colours of the famed Lido Parisian cabaret. Use with 1829 Light Grey Undercoat. French for ‘Water of the Nile’, a light, fresh and airy Art Deco green ideal for modern kitchens or bathrooms. Use with 1829 White Undercoat. An intense, deep and candied jewel green redolent of a popular Art Deco shade. Ideal for contemplative spaces. Use with 1829 Light Grey Undercoat. Driftwood white hues with a velvety cloud lightness make this an effortless and opulent modern shade. Use with 1829 White Undercoat. A rich stone blue with a smooth matte density, this colour is a version of a popular Art Deco pastel blue. Use with 1829 White Undercoat. Intense, elemental and bronze-glazed grey. An excellent treatment for garden facing windows and French doors. Use with 1829 Light Grey Undercoat. A deep, exotic spiced brown. Indulgent and tactile, it will add a warm and intimate hue to any small room. Use with 1829 Light Grey Undercoat.